Shirts With Random Triangles: Alabama AD Bill Battle Taking Brief Leave Of Absence For Cancer Treatment. Alabama AD Bill Battle Taking Brief Leave Of Absence For Cancer Treatment. Bill Battle with Nick Saban. Image via cbssports.com. 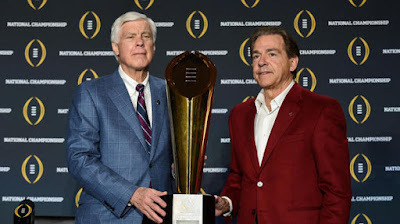 Thoughts and prayers go out to Alabama athletic director Bill Battle, who is taking a brief leave of absence from his position to undergo treatment for cancer. A statement from the University of Alabama stated that Battle has been privately undergoing treatment for multiple myeloma, a treatable form of cancer that affects plasma cells in bone marrow. Battle was first diagnosed with the disease in 2014. "In the spring of 2014, I was diagnosed with a treatable form of cancer," Battle said. "Subsequent to that diagnosis my wife, Mary, and I visited with doctors at The University of Alabama at Birmingham Medical Center; University of Texas MD Anderson Cancer Center in Houston, Texas; the Lewis and Faye Manderson Cancer Center at DCH Regional Medical Center in Tuscaloosa; and the Winship Cancer Institute to determine the best treatment options. I am very comfortable with the diagnosis and treatment plan. I am looking forward to getting this behind me and continuing my active lifestyle, as well as continuing to lead our Athletics Department. My experience has made it clear to me that cancer can be a treatable disease that can be dealt with while maintaining a high quality of life." While Battle has continued to perform his duties at the school, he will require some time off to undergo stem-cell treatment in Atlanta at The Bone Marrow and Stem Cell Transplant Center at the Kinship Cancer Institute of Emory University. Treatment is expected to take a few weeks. Battle says he will "be in touch via e-mail" while undergoing treatment, and is expected to be back in Tuscaloosa in July.